One of the innovators that strives to break barriers in the hair care world is Jane Carter, who has been recognized around the globe as a leading natural hair care innovator. Let’s celebrate her achievements and find out what makes her journey unique! Jane Carter has been a professional hair stylist and salon owner for over 20 years, representing women and catering to diversity. She has experienced a lot in her life that has shaped her into the woman she is today. From segregation and racism to being one of the first African-American students to be admitted into a white elementary school at the age of six, Jane Carter understands the importance of diversity. Jane is committed to creating a global beauty community that includes all hair types and textures with an intention to help women embrace their natural beauty. Jane experienced a respiratory allergic reaction from ingredients used in traditional beauty products, so she decided to create her own product line using plant-derived ingredients, essentials oils, sea botanicals and natural proteins that are specifically designed for all hair types and textures. In 1992, she created her first product, the Hair Nourishing Serum, that marked the official beginning of the Jane Carter Solution product line. Her line has expanded to leave-in conditioners, gels, shampoos and body butters, to name a few. Jane has won numerous awards and has been featured in magazines such as Black Enterprise, ESSENCE, and InStyle as being a leading manufacturer of all natural hair products, created for ALL hair types. In 2005, she began selling her product line in Whole Foods Market, it's now available in over 200 stores. The Queen Bey has even named Jane Carter Solution as one of her holy grail beauty lines! Ahhh, that’s major! At Jane Carter Solution we believe hair isn’t defined by ethnicity or race, it is defined by hair type and texture… fine, medium or coarse, straight, wavy, curly or coily. Our goal is to help you simplify your hair care routine and love the hair you wear! One of my favorite products from the line is the UnTangle Me Weightless Leave-In Conditioner. It is made with mango butter, slippery elm, marshmallow root. It moisturizes your curls while helping to prevent frizz. My hair felt so soft after using this product and the moisture I experienced was amazing. I couldn’t believe how soft this leave-in made my hair after one use. Detangling my hair was simply a breeze. I also loved the Coiling All Curls Elongating Gel. I never thought that I would be able to achieve a super defined wash and go with my tightly curly hair but with this gel I was able to achieve a very defined wash and go that wasn't crunchy or flaky. This line is amazing for helping to add moisture to your hair and also helps to strengthen it. Overall I loved this line and it will definitely be added to my regimen. Check out my full review below. 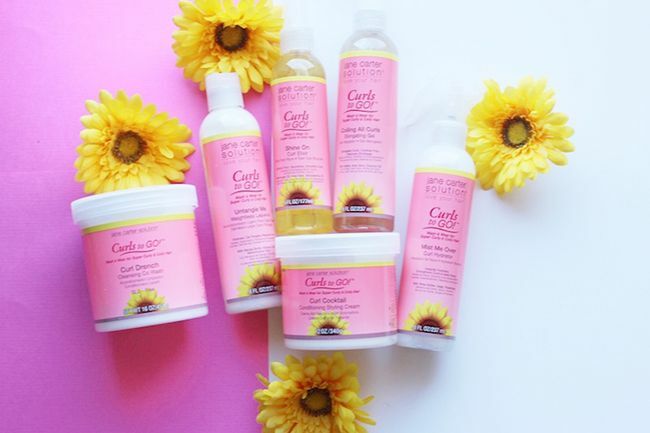 Have you tried the new Curls To GO Line? Let me know what you thought.